A few people started uploading videos to Youtube and I decided to get on the bandwagon and join them. Comment your thoughts please on any mistake you think I made or any thing that caught your attention as odd of a certain move that was made enjoy! Good to see more uploaders! lol at how bad he played though. When he finds your bomb at B2 he must insta capture that B1 piece with his captain and LOL at not protecting general with spy. It was a good idea to capture that general, it practically assures he will go for your colonel when he finds it - to his demise. I'm not sure if you always use the X formation in all 3 lanes (2 middle pieces diagonally and 2 scouting pieces diagonally), but that is kind of readable. Nothing to worry about when you play gold opponents, but vs platinum you need to mix it up a bit, I suppose. I happen to be a fan of the x formation i don't usually do this in all 3 lanes but i kinda went in to this game thinking i was going to win no matter what i do so i just went for that set up! What was your original rating when you started artificially lowering it? Just a little bit btw regarding your xformation in game you see me mention what happened to my scouts in question so I don't usually put 6 scouts not my front 2 lines. Hey guys ! My little test video has over 100 views and in a few hours so i decided to upload another game! unfortunately my commentating got messed up until 40 minutes in to game but it was a very intense match so I decided to upload it. on a second note i recently played unladen swallow which i will upload probably tomorrow! enjoy leave your comments on how you thought game went! Yes our game should be interesting. I had a VERY unlucky start (!!) but I managed to eventually get the win. More crazy then interesting lolz. please I value your opinion very high! You played a decent games here. 4:30 there is no point sacrificing your sergeant here. Best move is to keep chasing the major. He would use the scout anyway. 43:00 why not trade? it's ok to trade marshals here. Your objective would be to not trade colonels and then use your gen + col to sandwich other pieces. You make a mistake here (your opponent did too) and potentially allow him to trap that captain. 46:21 moving down with the spy is a mistake, he can fork both the spy and major with his colonel. It was best to move up. 52:13 It was better to keep your major stationary. GR would have had a chance to lotto otherwise (!!!) and potentially hit a flag, had he choose to sacrifice his miner instead. Luckily for you, he just gave up and conceded the game. -Don't use miners as scouting pieces. You will need them in endgame. Edited by Unladen Swallow, 28 November 2017 - 11:59 PM. 4:30 Sadly my commentary wasn't working at the time my reasoning for hitting scout. I thought he would simply just take sergeant with major and i wouldn't have chance to see the scout he also bought his scout to defend his major essentially i thought so why not hit. 43:00 I wanted to keep my spy advantage also i had mostly bombs and i doubt he would've lottoed in that spot later you see me change my mind bec he brings his colonel around the board. 46:21 I did not think to much in to it you see me playing with where to move spy for a few moments, I settled it next to bomb and a spot i don't mind his colonel to be. as for your tips thank you i will try and work on this! I took a chance with my gen. I was up a major at the time and were in sort of a stalemate. Taking another major with my gen was a calculated risk. If he had his marsh in the middle or other side it would have worked. My back up was to fake a spy covering the gen. I was wrong on both counts but there was some thought to the maneuver. General that comment was written about a different game the one by ouwesok. heh I was commenting on another game. I think game you played well upto the point that Fks became defensive. He did not have much choice, you were up a major and had 3-4 more pieces. Then you started to return small pieces on the right wing and got nothing in return. I would have chosen to sacrifice piece quality for information and maintain my small pieces advantage. If you attack on all three sides and make a single good guess and capture something that isn't recaptured, you are in really good shape. Even if you lose all exchanges, you maintain 3-4 pieces up, a big base that he must attack, all his pieces known and your marshal hidden. Hey as promised just uploaded my game between me and Unladen swallow! Enjoy the game leave a comment here or on video if you think I could have done anything differently or agree! The way US plays just really makes me doubt if I get the clue of the Stratego game. It's like playing chess on 3 boards simultaneously. This game really opens perspective. Many players I met surrender after loosing one or two big pieces. But playing this intelligent, slowly revealing the flags position, creates all kinds of opportunities. Great game. You put op a very decent fight! Edited by ScottLafaro, 30 November 2017 - 03:11 PM. I viewed the game without sound at double speed, so I did not listen to your commentary. The first thing I didn't like was when you found that captain on the left and went after it with another captain. That is a losing exchange for you, known captain vs unknown captain. Also, you are not interested in exchanges, you need to find out where that marshal is and should activate your colonels. His marshal cannot be everywhere. Just go with your colonel at that captain and try to trap it. If he recaptures with his marshal, you are still way ahead in material and your general and colonel are certainly getting into play catching something now, but there is a fair chance that you will just win a captain. Capturing that colonel was good. Not sure why it took so long, you simply cannot lose with this exchange. You are a general up. If you lose to the marshal, you will be a colonel up with no generals on the board. That is the same thing. After that you must include your colonel somewhere in that rush of majors and try to capture a major rather than exchange all of them. Every exchange helps him, you are up a general and colonel, but down 3-4 pieces and you need to get some back. Again, if you manage to e.g. capture a major with your colonel and he happens to recapture, you have lost NO MATERIAL. Instead of a colonel up, you will be a major up AND know where is marshal is. As played, you exchanged everything and at the end his marshal captured your colonel, without even getting anything for it. It would have been a lot better to hand him over that colonel in the early game after just jamming into some random piece that moved. Very good game and commentary . 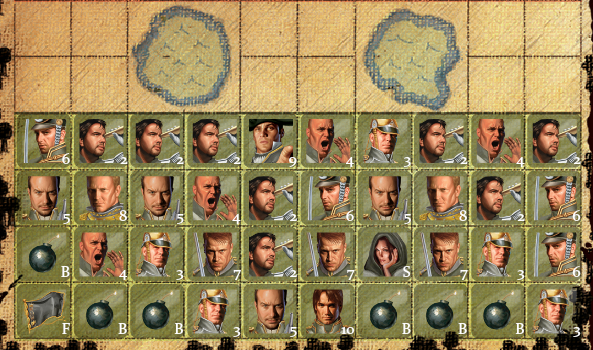 When you got his colonel with Gen on the right you had an unknown colonel on the left near 3 moved pieces .If you'd hit those you either get 1 or 2 pieces for free or 1 piece and find Marshal . If it was the latter then your general can kill probably 2 more pieces on the right . That would have cut down his numerical advantage and then there are very few bluffs he can play. I should not have allowed this to happen. I did not expect him to make this move as he did not do much attacking prior to that. However, I couldn't have moved left either (escape via 2sr) as it would have been trapped by both major pieces. I believe I should have made some more room to escape prior to moving my colonel there. Again, if you manage to e.g. capture a major with your colonel and he happens to recapture, you have lost NO MATERIAL. Instead of a colonel up, you will be a major up AND know where is marshal is. That is correct. In that setup, I have all of my majors buried on the 3rd row and I do not allow any colonel to "sacrifice" onto a major. I've played this setup a few times versus good players and I get a feel for how to play it. Thanks guys for commenting. To be honest if i had a more aggresive mindset during game I probably would have given my self a better chance of winning but alas I was nervous that i had the numerical lead and was stingy to give it up which caused me to lose haha! Thanks unladen for a sweet game again!